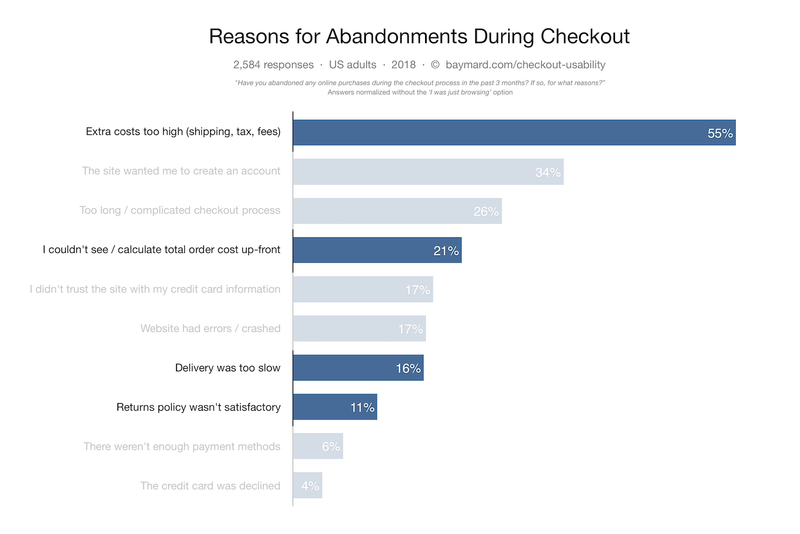 Studies of reasons for checkout abandonment show that return policy and shipping info are a direct cause for massive abandonments. 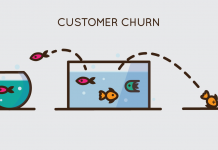 While both shipping and return information should be available through multiple paths on e-commerce sites — for example, via the site header, on the product details page, or sitewide search results — a large-scale qualitative usability testing revealed that a subgroup of users will consistently look in the footer when seeking shipping and return information. It’s true for both mobile and desktop users, although more frequently with desktop users. Despite the importance of direct links to ‘Shipping Info’ and ‘Return Policy’, our benchmark reveals that 20% of e-commerce sites neglect to provide a simple text link to this in their footer. For some users, a site’s return policy is crucial to their decision on whether to purchase a product from a particular site. 11% of users have abandoned one or more shopping carts in the past quarter solely due to unsatisfactory return policy. During testing, many users voiced their questions regarding return policies and procedures when buying online — for example, Can the item be returned? Do I have to pay for return shipping myself? How long do I have to return an item? Does that deadline include the shipping time? 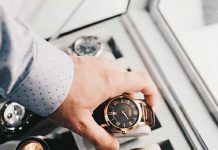 Answers to these questions are often central to a user’s buying decision as they need to feel confident that they can indeed return the items if there’s something wrong with them and be reassured that the return procedure will be simple and straightforward. Similarly, shipping information can also be crucial for users; in particular the cost and expected delivery date. Shipping information also ties directly into users’ desire to learn about the return policy — if they have to return a product, how much will they lose on any non-refundable shipping costs? In fact, shipping information is so important to some users that they want to know the shipping options available to them before they will even commit to adding a product to their cart, let alone entering the checkout process. 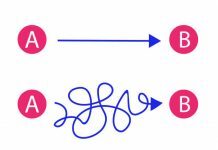 When there is no immediate path to shipping information or the return policy, users must go “information hunting”, which, depending on how easy it is to find the information elsewhere on the site, results in an often substantial delay in product browsing. 57% of e-commerce sites do have information on or a link to returns and shipping within the product page content itself. This is helpful and many users find and use this information here while browsing the product page itself. However, in multiple usability testings, there’s always a subgroup of users who consistently try to find this information in the footer, even scrolling past the relevant section on the product details page that would have provided the information. For this subgroup of users, the footer is mentally “the place to go” when it comes to finding information on a site’s return policy or shipping options. 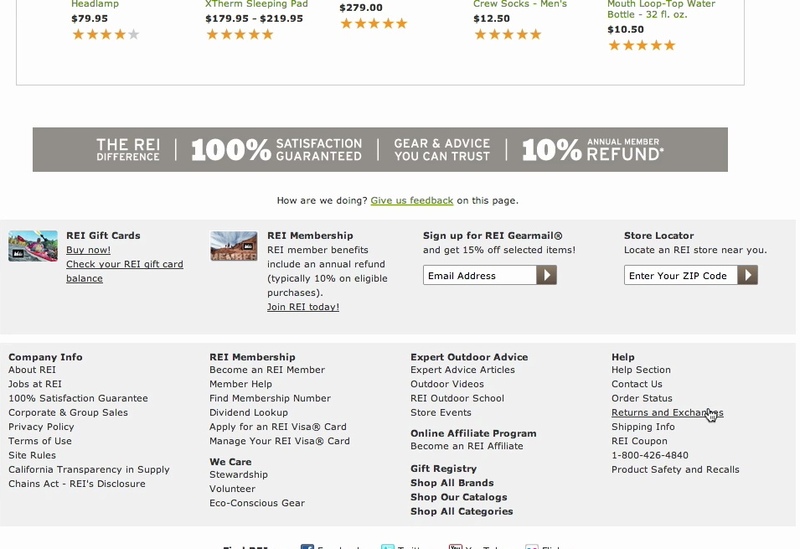 Additionally for shipping, many sites advertise “Free Shipping” using sitewide banners, or in the sitewide header, but, despite the visual dominance, testing reveals that these highlights are prone to be missed altogether by users, and thus aren’t substitutes for a direct link to standard shipping information on the product page and in the footer. “I go to the bottom because that’s where it usually has all those things [like return policies]”, a user explained while he scrolled to the footer when looking for the site’s return policy. Despite the importance of return and shipping information, and despite a subgroup of users exhibiting the clear behavior of going straight to the sitewide footer, 20% of e-commerce sites don’t support this user behavior. Many sites make it unnecessarily difficult to find their shipping and return information in the sitewide footer by tucking their “Return Policy” away behind generic footer links to “FAQ” and “Help” sections, failing to have direct stand-alone links to “Shipping Info” and “Return Policy” from the footer. It’s also important to keep in mind the keywords that users are scanning for in the footer (e.g. “return” or “shipping”). Highly unconventional phrases such as “Don’t like it? Send it back” (instead of “Returns”) should therefore be avoided, as they won’t match the specific keywords users are looking for. If unconventional words or phrases are used users have to actually read all the footer links instead of simply scanning them until they spot the keyword that they’re looking for (or, for the more tech-savvy users, use their browser’s “find on page” feature to find the keyword for them). This is also part of the reason why only having a generic “Help/FAQ” link in the footer is an issue – it impedes scannability. Despite return policies, shipping cost, and shipping speed being among the top reasons for abandonment, and despite that a subgroup of users exhibit the clear behavior of going straight to the sitewide footer, 20% of e-commerce sites don’t support this user behavior. It’s important to keep in mind that regardless of whether the user is on desktop or mobile, the footer is still associated by a subgroup of users as “the place to go” to find information on the site’s return policy or shipping information. While this information also needs to be directly within the product page content, shipping and return policy information should always also be accessible from the footer. Within the footer, it’s not enough to just have a generic link, e.g. to “Help”. To aid scannability and findability the site would still need separate stand-alone links for “Return Policy” and “Shipping Info”. PS. Sometimes, when you can’t (or don’t want to) offer a free shipping or free returns, there’s a tendency to hide the link behind a few steps and not advertise it too much on the site. Don’t do it. It creates more harm than good. Customers will see it anyway, and if they see it later rather than sooner, you’ll lose their trust, and – most probably – their purchase.